Chassis 0764 was the fourth and final '335 S' Ferrari built. Constructed specifically for the popular American road races, it was completed late in 1958. It uniquely featured the 'pontoon fender' style body that was more commonly used for the smaller engined 250 TR. The most noticeable difference is the extended body-panel behind the left front-wheel to provide additional cooling to the massive engine. This quad-cam V12 was officially rated at 390 bhp but figures well in excess of 400 bhp are closer to the truth. Shortly after it was completed, 0764 was shipped to Ferrari's man in the United States, Luigi Chinetti. He sold the car to privateer racer Alan Connell, who showed the ferocious Ferrari at the 1959 New York Auto Show ahead of a full season of races. Connell recorded some notable results, including two wins in minor races. During the 1960 season the engine failed and the complete car was returned to Ferrari for a complete rebuild. While the engine was repaired back in Maranello, the car was shipped back to the United States. For nearly two decades the chassis and engine were separated until they were reunited by then owner Robs Lamplough. He raced the car in historic events for some time but once again the complicated engine let 0764 down. Fully repaired, Lamplough offered the car during the 'bubble' in the early 1990s and quite remarkably refused an offer of $9.0 million during a Christie's Auction. Lamplough eventually sold the car to American collector William Bauce for around $3 million in 1993. He showed and raced the car at a variety of events like the Mille Miglia and Pebble Beach Concours d'Elegance during the next few years. It was then completely restored before joining a Japanese collection for a brief spell. In 1998, it was acquired by American collector Bruce McCaw. 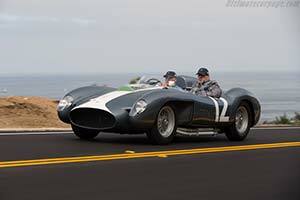 He also showed the car at Pebble Beach and raced it at several editions of the Monterey Historic Races. Late in 2013, it changed hands once again. Now in Austrian hands, it was shown at the 2014 Cavallino Classic before it was entrusted to Paul Russell for a complete restoration. Much time was spent to get the correct blue colour used when the car was originally raced by Alan Connell. The restoration was finally completed in time for the 2017 Pebble Beach Concours d'Elegance where Ferrari's 70th anniversary was celebrated. Russell's impressive work was awarded with a best in class award.